I pushed those concerns away for the sake of convenience (after all, filling my own coffee filter with fresh ground coffee takes all of what … two minutes? I’m a busy person, just like you!). The rubber tubing and the internal tank of the Keurig cannot be drained. It is possible that bacteria and mold are happily living inside that hidden water tank where it is nice, dark, and warm. Another mold-magnet is that black rubber ring on the bottom of the exterior water container. Look now! Is there green or black slime? Ewwwww (biofilm!). 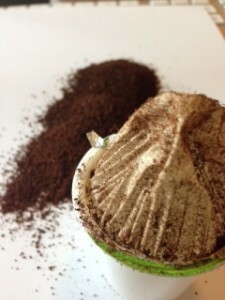 The Plastic – The K Cup is a composite plastic, #7. Although this is technically BPA-free, the chemicals from the composite plastic are not safe and they still have estrogenic activity. As long as I mentioned fake estrogens coming from the plastic in your K Cup, don’t make a bad situation worse by adding soy milk to your coffee! (Men, would you like “moobs” with your mocha and soy?). The Cups Are Non-Recyclable – This is a big problem for the environment since we have seen an explosion in the use of single cup coffee makers, like Keurig, in the last few years. MotherJones.com reported, over 8.3 billion K Cups a year are discarded, enough to circle the earth 10.5 times! Dr. Stephanie Seneff, PhD recently gave a talk, “How aluminum and glyphosate (Roundup) collaborate to cause anxiety, depression, autism and celiac disease” you can still get MP3s and transcripts if you are interested. The Filter – The filter is made of filter paper and ? – I don’t know but somehow it is fused or glued inside the plastic cup. Reusable K Cups – Although there are reusable K Cups called My K-Cup on the market, you are still faced with the stagnant water situation and hidden water tanks and tubing that cannot be cleaned. The reusable My K Cup still needs to be filled every time you make a cup of coffee and the filter needs to be cleaned every time. There goes your convenience, but if you are willing to risk the microbes, then this is better for the environment and more economical. The Coffee – The flavored coffee K cups are typically flavored with “natural” or artificial flavors. We know that food manufacturers use these names to hide ingredients that act like MSG, a neurotoxin. I help people get to the root cause of chronic migraines and headaches. Often these MSG flavors are causing the problem. There is nothing like a steaming hot cup of freshly brewed coffee made with quality coffee beans. Using the Keurig was easy, but the taste was marginal. I do not consider myself a coffee connoisseur, but I love a good cup of coffee. Finally, I allowed myself to consider all the issues with the Keurig and I decided to kick my Keurig to the curb. The coffee beans you purchase should look inky black and ideally they are Fair Trade, organic and shade grown. Are you sipping pesticides with your brew? We know that pesticides are contributing to the growing rate of cancer, Parkinson’s Disease and miscarriage. Use non-bleached filters. White filters have been bleached with chlorinated bleach. Shade grown coffee is better tasting coffee because shade-coffee beans ripen more slowly, resulting in a richer flavor. More importantly it is better for the environment and provides a healthier environment for the workers. When shopping look for Organic, fair trade, shade grown beans. Get a grinder and grind at home. Brew using spring water. Many people consider the French Press to be the ultimate coffee brewing method. Coarse ground coffee is allowed to steep for several minutes in boiling water in the French Press. The result is a richer, fuller flavor with more aroma and a more delightful coffee experience. It is interesting to note that French Press coffee is higher in cafestol, a fraction of coffee that has been shown in studies to raise triglycerides and LDL cholesterol. 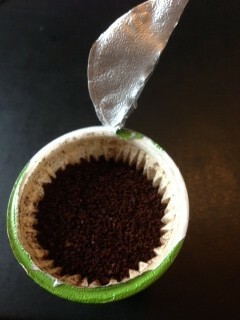 Using a non-bleached coffee filter with a coffee maker will remove the cafestol. Here is a link to one of the 15 studies found on PubMed.gov. For the general population the evidence from several large studies suggests that moderate coffee drinking is not detrimental to health and may have several health benefits. If coffee gives you the shakes, disturbs sleep, and increases stress, then cut back or eliminate coffee. It is never healthy to drink pesticides in coffee. It is never healthy to have an increased exposure to estrogenic compounds from plastic K Cups. It is never healthy to continue to make coffee with any machine that is harboring mold and bacteria. 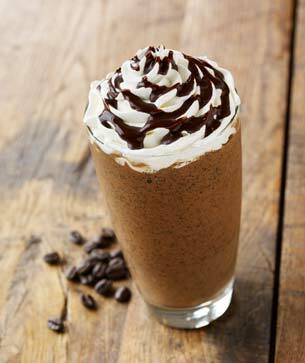 Java Chip Frappuccino, 460 calories, 90g carbs (22.5 tsp sugar). Starbucks Frappuccino – The Java Chip Frappuccino is making you fat and sick! 460 calories for the biggie but worse than that it delivers 22.5 tsp of sugar to your blood stream (90g carbs). This amount of carbohydrate in liquid calories is a disaster for your blood sugar, and it will be too much for the body to handle effectively so the excess sugar will be sent to the liver where it is turned into F.A.T. 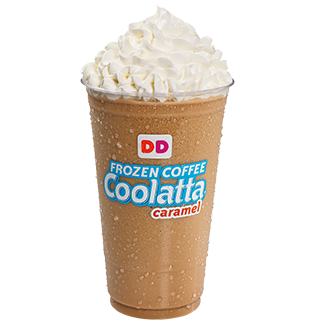 Frozen Caramel Mocha Coffee Coolatta with skim milk. 600 calories, 144g carbs (36 tsp sugar). 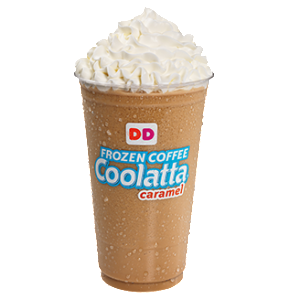 Dunkin Donuts Coolatta – The Frozen Caramel Coffee Coolatta is making you fat and sick! 600 calories for the large mocha with skim milk. This little darling will deliver 36 tsp of sugar to your bloodstream (144g carbs) leaving you too full for your next meal but packing on the fat from the excess sugar. Get the good beans, grind them fresh, brew it yourself. Be good to yourself. Be good to the earth.